How does Cherry Mobile Apollo X differ from the original Apollo device? Cherry Mobile Apollo X is the spin-off to the popular device released last year. The newcomer crosses the phablet territory with its 5.5-inch IPS HD (720 x 1280p) display. Aside from the legit screen, the Apollo X also boasts a 1.3 gigahertz quad-core CPU and 13-megapixel rear camera. The features are arguably very promising but the fact that it carries the same Apollo moniker, prospective buyers would immediately compare it to the original handset. So how does the newbie differ from the first Apollo? For one, the local company packaged the device with a Php 5,999 price tag, that’s almost Php 1,000 cheaper than the original Apollo when it became available in the public last year. In terms of internals, the Apollo X is a tad faster than the 1.2 GHz of the standard device. Both have the same 1GB of RAM; however the Apollo X has a bump in internal memory with its 8GB configuration (Apollo only has 4GB). In terms of camera, the new handset is also the winner shading the 12-megapixel rear shooter of the 4.5-incher. Likewise, its front camera is rated 8-megapixel which definitely clouds the 5-megapixel of the smaller handset. Both have 3G HSPA+ connectivity as well as dual-SIM functionality. 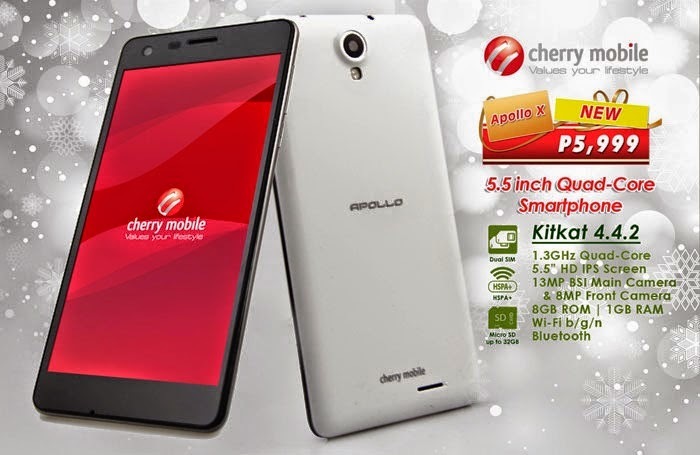 The Cherry Mobile Apollo X will be available before the year ends. Pinoy Metro Geek: How does Cherry Mobile Apollo X differ from the original Apollo device?